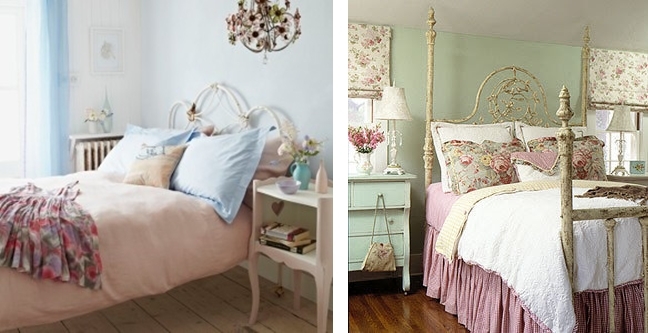 The best color schemes for shabby chic walls are light pastels, including blue, pink, light green, cream and white. These calming colors will help you unwind and relax when you get into the bedroom. You can also add color through pattern. For instance, if you don’t fancy following the all white shabby chic pattern, choose wallpaper in classic colors and patterns like a toile de jouy or damask. Shabby chic is all about lightly – worn laces, eyelet laces, and linens. Pile up different soft furnishings, patterns and bedding fabric to make your bedroom more comfortable and cozy. Add mismatched cushions together with soft bedspreads, pillows and duvets to achieve that ultimate chic elegance. The light in your shabby chic chamber should be soft, warm and relaxing. Consider using old-school bulbs. These can be paired with a crystal or wrought iron chandelier that you can hang right in the middle of the room. You can also add lamps with alternatively-patterned shades. Lace, florals, toiles and even stripes on the lamp shades will help you add that chic feel to your bedroom. Arranging some fresh flowers (especially Honeysuckle, lupins, lavender and roses) in a vase will also come in handy in making your room look brighter. Always invest in quality furniture for your bedroom. Slightly worn wood and metal finishes on the bedroom furniture is essential when you are going for the shabby chic décor. What is more, you can either paint or leave the furniture in its natural finish. You could also choose a French- style bed frame, recycle old furniture, and throw in different classic furniture pieces such as dressing tables, stools and settees. Then, team the classic furniture with wooden paneling or flooring to create a welcoming and beautiful ambiance. Vintage textiles, salvaged furniture and other handicrafts are the hallmarks of the shabby chic bedroom. The color scheme, lighting, furniture pieces and bedding should also reflect that chic but vintage look. 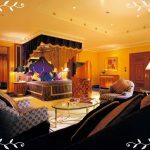 What is more, you can easily achieve a shabby chic bedroom at a limited budget. Try your hand at it today.